A trio of lawsuits filed by federal employees this week argue that the law that allows agencies to require them to report to work without pay during a shutdown violates the Constitution’s due process protections and the prohibition against slavery. The National Treasury Employees Union, the National Air Traffic Controllers Association, and a group of five anonymous federal employees from unfunded agencies all filed separate lawsuits in the U.S. District Court for the District of Columbia challenging the government’s practice of excepting some federal workers from shutdown furloughs while withholding their pay until after agencies reopen. In the filings from the air traffic controllers and the five federal workers, they claim that by requiring employees to work without pay during a shutdown, agencies are violating the provision of the Fifth Amendment that states that no one can be “deprived of life, liberty, or property, without due process of law.” The suits argue that federal workers “have a constitutionally protected property interest in being paid their salary” on a timely basis. The five federal workers also allege that being forced to work without a timely paycheck violates the 13th Amendment, which banned slavery, citing the threat that agencies would place excepted federal workers in absent without leave status if they did not report to work. 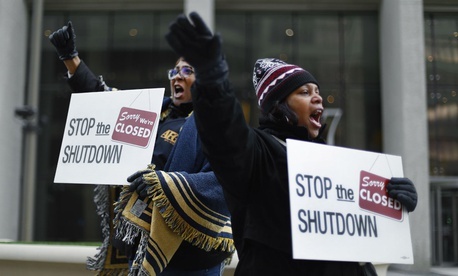 All three lawsuits argue that the Trump administration’s self-described efforts to make the shutdown “as painless as possible,” ordering agencies to try to stay open as long as possible using carry-over funds and other mechanisms, constitute a violation of the Anti-Deficiency Act, which bars the executive branch from spending money not appropriated by Congress. “Congress amended [a provision of] the Anti-Deficiency Act in 1990 to provide explicitly that ‘as used in this section, the term “emergencies involving the safety of human life or the protection of property” does not include ongoing, regular functions of government, the suspension of which would not imminently threaten the safety of human life or the protection of property,’” NTEU wrote. The union argued that a Justice Department legal opinion in 1995, which concluded there need only be “some reasonable and articulable connection” between a governmental function and the protection of life and property, upon which Office of Management and Budget Director Mick Mulvaney based his decision-making, was overly broad and counter to the intent of Congress’ actions in 1990. The road forward for these lawsuits is uncertain. There already is a stumbling block in one case: U.S. District Court Chief Judge Beryl Howell ruled Thursday that the anonymous plaintiffs failed to meet the “heavy burden” required to remain anonymous in a court case, and would have to identify themselves if the case were to move forward. The lawsuits from the anonymous plaintiffs and the National Air Traffic Controllers Association also join two recent lawsuits from NTEU and the American Federation of Government Employees, which claim agencies are violating the Fair Labor Standards Act by failing to pay workers’ salaries on a timely basis. Given a 2013 court decision awarding damages to excepted federal employees who worked during the 2013 shutdown, these claims are likely to succeed.